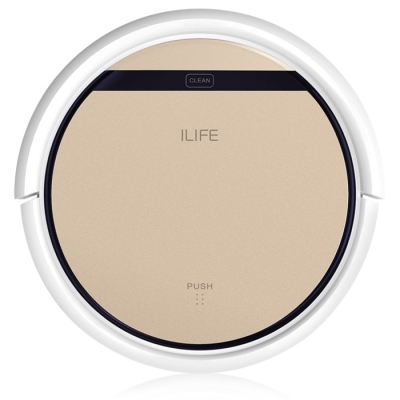 Successfully Added ILIFE V5S Pro Robotic Vacuum Cleaner IR Remote Control Anti-Collision Smart Robot Sweeper for Home Gold (EU Standard) to your Shopping Cart. Automatic cleaning for home and office, large cleaning area: 150-180 square meters. 2 in 1 dry and wet cleaning modes, it can meet your different needs, you can choose the dry or wet mop. Anti-collision system, it can better protect the furniture. A timing function, you can set up a time to clean the room. Set the start time, and make the cleaning schedule at the fixed time even you are not in the home. This robot vacuum cleaner can recognize the barrier and avoid a collision. Self-help ooze water design, it can continuously work for 120-150min. This cleaner can work in the narrow places, it is possible to clean the area under furniture and the corner. The noise is less than 50dB, easy to help you solve the noise problem. Easy to absorb dust, hair, paper, reduce the pollution of PM2.5. Automatic cleaning, spot cleaning, edge cleaning. Automatic cleaning, border cleaning, spot cleaning, schedule cleaning and mopping. IR remote control with LCD display for easy operation. Built-in 4 Li-ion batteries, the working time is longer than before. The intelligent water tank is controlled by the pump, which can effectively lower the damage caused by the water inflow. We adopt imported brushless motor, which improves the working efficiency and reduces the operation noise.